Espenhain project is the world's largest solar power station which was officially put on stream in the eastern German town of Espenhain near Leipzig . 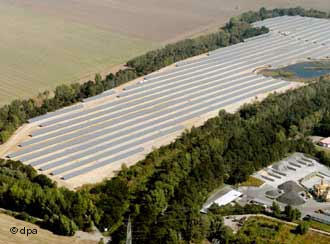 The five-megawatt facility, located on a former lignite mine ash deposit, consists of some 33,500 solar modules. The output equates to the electricity needs of some 1,800 households . GEOSOL is the initiator and project developer, with Shell Solar serving as the prime construction contractor and supplying its high- performance photovoltaic "SQ" series modules.